What It Is: Lou Bloom (Gyllenhaal) is a jobless thief. He steals metal works to turn a small profit. One night on the way back from a scrouge he sees a car accident. Upon walking up to the scene he meets Joe Loder (Bill Paxton) and his camera. Joe is a nightcrawler, or someone who shoots footage of news worthy events and sells them to various outlets. Lou believes this is his calling and sets out to procure a camera with which to begin his journey. As he shoots vairous car accidents he begins to realize he might be good at this, and he isn’t the only one thinking this station manager for the lowest rated news team in Los Angeles channel 6 Nina (Russo). Nina sees Lou potential and the two begin a beautiful…partnership. But to what length will Lou go to get the shot, and scoop everyone else? What We Think: Mr. Gyllenhaal better have a speech ready because this guy might be winning some accolades come awards season. His turn as Lou Bloom is equal parts eerie and unhinged. Rene Russo plays her part with such a fervor we haven’t seen from her in quite some time. Los Angeles as a city hasn’t looked this good since Nicolas Winding Refn had a driver take a stroll throughout a neon hued near future. It’s so beautifully shot that it turn it’s atmosphere into part of the film, and it seems as if this couldn’t have worked in any other city but L.A.
Our Grade: A+, It’s an unsettling film for sure, but one that’s worth it weight. Lou Bloom is a despicable character, yet one you can’t help but appreciate due simply to his unwavering want to succeed. You’re never sure why you won’t this guy to win, but you do. 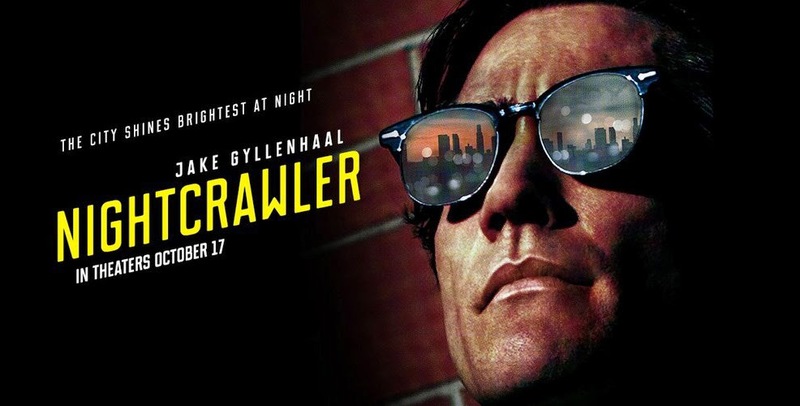 Nightcrawler is among the best of 2014, and it wouldn’t surprise me if Gilroy takes home an Original Screenplay Oscar, because he’s definitely getting nominated. Gyllenhaal has been on an absolute tear recently, and I hope to see him continue to spread his wings with more interesting characters. Something he’s done the entirety of his career.